One says ‘NOISE', another says ‘OOOF’. Paintings and words, words and paintings – Ed Ruscha’s (pronounced rew-shay) work has always hinged on these dynamics. Many artists have done the same sort of thing since him but he’s made a whole career out of it. This exhibition looks at fifty years of his painting – canvases that are each ambiguous and provocative. The show traces the inventive progress that turned this former ad-agency employee into one of the Pop pioneers. It all began in the fifties when the artist discovered in “the ultimate cardboard cut-out town” of Los Angeles a backdrop for all that he wanted to say about modern American life. He's since been recognised as capturing it perfectly by the likes of the novelist James Ellroy who described Ruscha as the great "narrative historian of the most scrutinised city on earth." Ever since he painted Noise in 1963 – a neat paradox of mute noun and loud colour, Ruscha has been searching for new ways to make pictures speak. 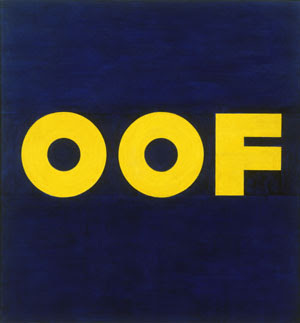 He started with the sight gag: "Oof" punches out of dark blue paint in sudden yellow. "The End" in Gothic lettering scrolls endlessly down the screen as if the picture were stalled. So what does the writing on Ruscha’s canvases – sometimes of mountains, sometimes fields or cinemas– have to do with the images? Really the answer in nothing. He paints words out of context, giving them a life of their own as figures in a landscape; and he pictures words as images. The show contains one of his is signature images where he depicts the Standard gas station from a one-point perspective as if flashing past in a car. And then again, we see the station on fire with the flames blurred. 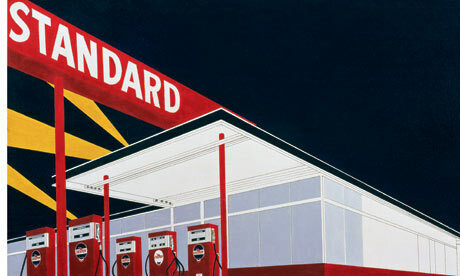 “I’m interested in glorifying something that we in the world would say doesn’t deserve being glorified,” said Ruscha. The artist has set about transforming anything into art — from single words to common phrases, from Chiclets chewing gum to pharmaceutical capsules, from company trademarks to travel brochures, and roadside gas stations to city grid plans. Ruscha's methods have definitely changed over the years – from brushwork to stencil and spraygun, with a brief diversion into weird substances in the 70s – but what’s so remarkable is that his paintings never date. I don’t want to give away all of the gags – as that’s what these paintings are – gags. They’re good fun but they also say something about the American mind. Just one last one, this one is my favourite. Moderna museet – Stockhom until 5th September 2010. Well the Obamas are fans - do you need another reason? A canvas by Ed Ruscha hangs on White House walls. The most rewarding part of this show will be the time that you spend thinking afterwards. Ruscha unsettles the world with his deadpan wit. This exhibition presents works ranging from his debut at the famous Ferus Gallery in Los Angeles, Documenta Kassel and the Venice Biennale, to the present day, when new generations are discovering his radical oeuvre. ALL of it is worth a look. That Hollywood one is pure genius. Wish I could see this for myself! Dear Eve, I'm sorry to use this article on your blog for asking an autograph but i don't know how to join you. I'd like to tell you that i find you gorgeous and handsome. I love also your "sens de l'humour" (i don't know the english word). 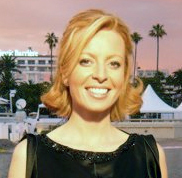 I hope you love France and you're going to stay a long time in France 24 because you are the sunshine of this channel. Fred, a huge french fan.